The Martin B-26 Marauder was a World War II twin-engine medium bomber built by the Glenn L. Martin Company. The first US medium bomber used in the Pacific Theater in early 1942, it was also used in the Mediterranean Theater and in Western Europe. The plane distinguished itself as "the chief bombardment weapon on the Western Front" according to an United States Army Air Forces dispatch from 1946, and later variants maintained the lowest loss record of any U.S. combat aircraft during World War II. Its late-war loss record stands in sharp contrast to its unofficial nickname "The Widowmaker" — earned due to early models' high rate of accidents during takeoff. Picture: Closeup view of Martin B-26C in flight. In March 1939, the United States Army Air Corps issued Circular Proposal 39-640, a specification for a twin-engined medium bomber. Six months later, Glenn L. Martin Company was awarded a contract for 201 planes. This design, Martin Model 179, was accepted for production before a prototype even flew. The B-26 went from paper concept to working plane in approximately two years. The lead designer was Peyton M. Magruder. Closeup view of Martin B-26C in flight. Picture: WASPs on flightline at Laredo Army Air Field, Texas, 22 January 1944. Once the first aircraft came off the production line in November 1940, Martin conducted tests, the results of which were promising. The first B-26, with Martin test pilot William K. "Ken" Ebel at the controls, flew on 25 November 1940 and was effectively the prototype. Deliveries to the U.S. Army Air Corps began in February 1941 with the second plane, 40-1362. In March 1941, the Army Air Corps started Accelerated Service Testing of the B-26 at Patterson Field, Ohio. The Martin electric turret was retrofitted to some of the first B-26s. Martin began testing a taller vertical stabilizer and revised tail gunner's position in 1941. Picture: Martin B-26G Marauder at the National Museum of the United States Air Force. While the B-26 was a fast plane with better performance than the contemporary B-25 Mitchell, its relatively small wing area and resulting high wing loading (the highest of any aircraft used at that time) required an unprecedented landing speed (120-135 mph/193-217 km/h indicated airspeed depending on load). At least two of the earliest B-26s suffered hard landings and damage to the main landing gear, engine mounts, propellers and fuselage. The type was grounded briefly in April 1941 to investigate the landing difficulties. Two causes were found: insufficient landing speed (producing a stall) and improper weight distribution. The latter was due to the lack of a dorsal turret; the Martin power turret was not ready yet. Some of the very earliest B-26s suffered collapses of the nose landing gear. It is said that they were caused by improper weight distribution but that is probably not the only reason. They occurred during low-speed taxiing, takeoffs and landings. Occasionally the strut unlocked. The Pratt & Whitney R-2800 engines were reliable but the Curtiss electric pitch change mechanism in the propellers required impeccable maintenance. Human error and some failures of the mechanism occasionally placed the propeller blades in flat pitch and resulted in an overspeeding propeller, sometimes known as a "runaway prop". Due to its sound and the possibility that the propeller blades could disintegrate, this situation was particularly frightening for aircrews. More challenging was a loss of power in one engine during takeoff. These and other malfunctions, as well as human error, claimed a number of planes and the commanding officer of the 22nd Bombardment Group, Col. Mark Lewis. The Martin B-26 suffered only two fatal accidents during its first year of flights, November 1940-November 1941: a crash shortly after takeoff near Martin's Middle River plant (cause unknown but engine malfunction strongly suggested) and the loss of a 38th Bombardment Group plane when its vertical stabilizer and rudder separated from the plane at altitude (cause unknown, but accident report discussed the possibility that a canopy hatch broke off and struck the vertical stabilizer). The B-26 was not an airplane for novices. Unfortunately, due to the need to quickly train many pilots for the war, a number of relatively inexperienced pilots got into the cockpit and the accident rate increased accordingly. This occurred at the same time as more experienced B-26 pilots of the 22nd, 38th and 42nd Bombardment Groups were proving the merits of the airplane. In 1942, Senator Harry Truman was a leading member of the Senate Special Committee to Investigate the National Defense Program (the so-called Truman Committee), which was investigating defense contracting abuses. When Truman and other committee members arrived at the Avon Park Army Air Field in Florida, they were greeted by the still-burning wreckage of two crashed B-26s. Truman criticized both Glenn L. Martin and the B-26. Indeed, the regularity of crashes by pilots training at nearby MacDill Field—up to fifteen in one 30-day period—led to the only mildly exaggerated catchphrase, "One a day in Tampa Bay." The B-26 received the nickname "Widowmaker". Other colorful nicknames included "Martin Murderer", "Flying Coffin", "B-Dash-Crash", "Flying Prostitute" (so-named because it had "no visible means of support," referring to its small wings) and "Baltimore Whore" (a reference to the city where Martin was based). The B-26 is said[who?] to have had the lowest combat loss rate of any U.S. aircraft used during the war. Nevertheless, it remained a challenging plane to fly and continued to be unpopular with some pilots throughout its military career. Picture: B-26 flying over its target during World War II. icThe B-26 Marauder was used mostly in Europe but also saw action in the Mediterranean and the Pacific. In early combat the aircraft took heavy losses but was still one of the most successful medium-range bombers used by the U.S. Army Air Forces. Bombing from medium altitudes of 10,000-15,000 ft (3,048-4,572 m), the Marauder had the lowest loss rate of any Allied bomber - less than ½%. By the end of World War II, it had flown more than 110,000 sorties and had dropped 150,000 tons (136,078 tonnes) of bombs, and had been used in combat by British, Free French and South African forces in addition to U.S. units. In 1945, when B-26 production was halted, 5,266 had been built. Picture: U.S. Army Air Forces B-26B bomber in flight. 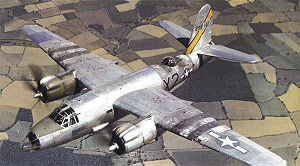 - B-26 - The first produced model of the B-26, ordered based upon design alone. The armament on this model consisted of two .30 inches (7.62 mm) and two .50 inches (12.7 mm) machine guns. (The last model was armed with nearly three times that number.) Approximate cost then: $80,226.80/plane. - AT-23A or TB-26B - 208 B-26Bs converted into target tugs and gunnery trainers designated JM-1 by the Navy. - CB-26B - 12 B-26Bs were converted into transport aircraft (all were delivered to the US Marine Corps for use in the Philippines). - JM-1P - A small number of JM-1s were converted into photo-reconnaissance aircraft. - B-26B, part of the Fantasy of Flight collection in Polk City, Florida. - B-26G (s/n 43-34581) is on display at the National Museum of the United States Air Force in Dayton, Ohio. This aircraft was flown in combat by the Free French during the final months of World War II. It was obtained from the French airline Air France training school near Paris in June 1965. It is painted as a 9th Air Force B-26B assigned to the 387th Bomb Group in 1945. - B-26G-25-MA (s/n 44-68219) is on display at the Musée de l'Air et de l'Espace in Le Bourget, France. It was also recovered from the Air France training school. - B-26 on display in Marietta, Georgia. Provenance unknown. - B-26B-25-MA (s/n 41-31773) "Flak Bait." The nose section is on display at the National Air and Space Museum, Washington DC. The remainder (mid and tail fuselage sections, wings, engines, and empennage) are stored at NASM's Paul E. Garber facility in Suitland MD. This aircraft survived 207 operational missions over Europe, more than any other American aircraft during World War II and will, one day, be restored and displayed at NASM's Steven F. Udvar-Hazy Center at Dulles International Airport VA.
1. Mendenhall, Charles. Deadly Duo. North Branch, Minnesota: Specialty Press Publishers & Wholesalers, 1981. ISBN 0-933424-22-1. Note: The 5,288 serial numbers published in this book effectively refutes the lesser count of the National Air & Space Museum. 3. Higham, Roy and Williams Carol (eds.). Flying Combat Aircraft of USAAF-USAF (Vol. 1). Andrews AFB, MD: Air Force Historical Foundation, 1975. ISBN 0-8138-0325-X. 14. United States Air Force Museum 1975, p. 37. 16. Loftin, L.K. Jr. "Quest for performance: The Evolution of Modern Aircraft." NASA SP-468. Retrieved: 22 April 2006. 17. Jane 1946, p. 245-246. 'B-26 Marauder in Action (Aircraft number 50). Carrollton, Texas: Squadron/Signal Publications, Inc., 1981. ISBN 0-89747-119-9. - Brown, Kenneth. Marauder Man: World War II in the Crucial but Little Known B-26 Marauder Medium Bomber. Pacifica, California: Pacifica Press, 2001. ISBN 0-93555-353-3. - Ehrhardt, Patrick. Les Marauders Français. Ostwald, France: Editions du Polygone, 2006. ISBN 2-913832-05-9. - Forsyth, Robert and Scutts, Jerry. Battle over Bavaria: The B-26 Marauder versus the German Jets, April 1945. Crowborough, UK: Classic Publications, 2000. - Freeman, Roger A. B-26 Marauder at War. London: Ian Allan Ltd., 1977. ISBN 0-7110-0823-X. - Green, William. Famous Bombers of the Second World War (2nd ed.). New York: Doubleday, 1975. ISBN 0-356-08333-0. - Hall, Tom. "Breaking in the B-26" American Aviation Historical Society Journal. Spring 1992. - Havener, Jack K. The Martin B-26 Marauder. Murfreesboro, Tennessee: Southern Heritage Press, 1997. ISBN 0-941072-27-4. - Hunter, Lawrence Jack. The Flying Prostitute. Lincoln, Nebraska: iUniverse.com, 2000. ISBN 0-59500-048-7. - Jane, Fred T. "The Martin Model 179 Marauder". Jane’s Fighting Aircraft of World War II. London: Studio, 1946. ISBN 1-85170-493-0. - Johnsen, Frederick A. Martin B-26 Marauder. North Branch, Minnesota: Specialty Press, 2000. ISBN 1-58007-029-9. - Listemann, Phil H. Allied Wings No.2: Martin Marauder Mk.I. France: www.raf-in-combat.com, 2008. ISBN 2-9526381-6-0. - Mendenhall, Charles. Deadly Duo: The B-25 and B-26 in WWII. North Branch, Minnesota: Specialty Press, 1981. ISBN 0-933424-22-1. - Moench, John O. Marauder Men: An Account of the B-26 Marauder. Longwood, Florida: Malia Enterprises, 1989. ISBN 1-877597-00-7. - Moore, Carl H. WWII: Flying the B-26 Marauder over Europe. Blue Ridge Summit, Pennsylvania: McGraw-Hill/TAB Books, 1980. ISBN 0-83062-311-6. - Nowicki, Jacek and Zbiegniewski, Andre R. Martin B-26, Vol. 1 (Militaria 137) (in Polish). Warszawa, Poland: Wydawnictwo Militaria, 2001. ISBN 83-7219-112-3. - O'Mahony, Charles. "Me & My Gal: The Stormy Combat Romance Between a WWII Bomber Pilot and His Martin B-26." Wings, December 1994. - Rehr, Louis S. and Rehr, Carleton R. Marauder: Memoir of a B-26 Pilot in Europe in World War II. Jefferson, North Carolina: McFarland & Company, Inc, 2003. - Scutts, Jerry. B-26 Marauder Units of the Eighth and Ninth Air Forces. Botley, UK: Osprey Publishing Ltd., 1997. ISBN 1-85532-637-X. - Swanborough, Gordon and Bowers, Peter M. United States Navy Aircraft Since 1911. Annapolis, Maryland: Naval Institute Press, 1990. ISBN 0-87021-792-5. - Tannehill, Victor C. Boomerang, Story of the 320th Bombardment Group in World War II. Self published. - Tannehill, Victor C. The Martin Marauder B-26. Arvada, Colorado: Boomerang Publishers, 1997. ISBN 0-9605900-6-4. - Wagner, Ray. The Martin B-26B & C Marauder (Aircraft in Profile No.112). Windsor, Berkshire, UK: Profile Publcations Ltd., 1965. Reprinted 1971.